Cook's arrival in Hawaii was followed by mass migrations of Europeans and Americans to the islands that gave rise to the overthrow of the Kingdom of Hawaii, the aboriginal monarchy of the islands, beginning in 1893. James Cook led three separate voyages to chart unknown areas of the globe for the British Empire. It was on his third and final voyage that he encountered what is known today as the Islands of Hawaii. He first sighted the islands on 18 January 1778. He anchored off the west coast of the island of Kauai near Waimea and met inhabitants to trade and obtain water and food. 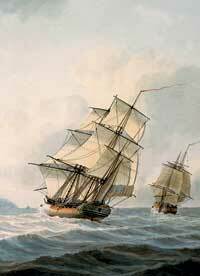 On 2 February 1778, Cook continued on to the coast of North America and Alaska searching for a Northwest Passage for approximately nine months. 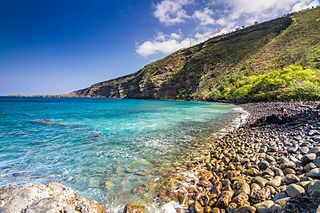 He returned to the island chain to resupply, initially exploring the coasts of Maui and the big island and trading with locals, then making anchor in Kealakekua Bay in January 1779. Cook and his crew were initially welcomed and treated with honour, as his arrival coincided with the Makahiki season, an ancient New Year festival in honour of the god Lono of the Hawaiian religion, and a celebration of the yearly harvest. However, after Cook and the crews of both ships, HMS Resolution and HMS Discovery, left the islands, the festival season had ended and the season for battle and war had begun under the worship and rituals for Kūkaʻilimoku, the god of war. Although Cook's sequential visits may have coincided with native traditional seasons, the natives had soured on Cook and his men by the time of Cook's initial departure. John Ledyard was the only American aboard Cook's ship during this time and the only citizen aboard the ship not loyal to the crown. Ledyard was present during the events leading up to and during Cook's death, and wrote a detailed account of the events in his journals. During Cook's initial visit, he attempted to barter and forcibly stole the wood used to border the natives' sacred "Morai" burial ground, used for high-ranking individuals and depictions of their gods. Ledyard says in his journals, Cook offered two iron hatchets for the wooden border around the Morai and when the dismayed and insulted chiefs refused, Cook proceeded to give orders to ascend the Morai, break down the fence and load the boats with it. John Ledyard also tells of an episode where Captain Clerke accused a native chieftain friend of stealing the Resolution's jolly boat. The boat was soon found unstolen and the native chief soured from the false accusation. After staying in the bay for 19 days, Cook and his two ships sailed out of the bay. Our return to this bay was as disagreeable to us as it was to the inhabitants, for we were reciprocally tired of each other. They had been oppressed and were weary of our prostituted alliance...It was also equally evident from the looks of the natives as well as every other appearance that our friendship was at an end, and that we had nothing to do but to hasten our departure to some different island where our vices were not known, and where our intrinsic virtues might gain us another short space of being wondered at. While anchored in Kealakekua Bay, one of only two long boats (lifeboats used to ferry to/from ship/shore) was stolen by the Hawaiians, testing the foreigners' reaction to see how far they could go with such a significant loss. The Hawaiians had begun openly challenging the foreigners. 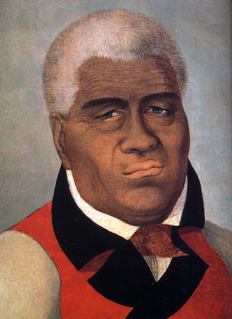 In retaliation, and in an attempt to force good behavior on the natives, Cook attempted to kidnap the aliʻi nui of the island of Hawaii, Kalaniʻōpuʻu. Possibly being quite sick at this point, Cook made what were later described as a series of mistakes. The idea or suggestion that the Native Hawaiians considered Cook to be the God Lono himself is considered to be inaccurate and is attributed to William Bligh. 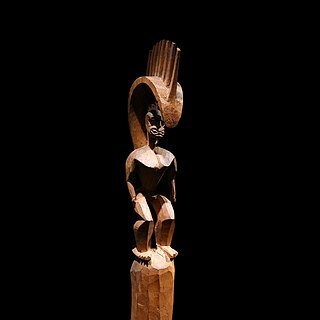 It is possible that some Hawaiians may have used the name of Lono as a metaphor when describing Cook or other possible explanations other than Hawaiians mistaking the explorer for their own deity. On the following morning of 14 February 1779, Cook and his men launched from Resolution along with a company of armed marines. They went directly to the ruling chief's enclosure where Kalaniʻōpuʻu was still sleeping. They woke him and directed him to come with them away from the town. As Cook and his men marched the ruler out of the royal enclosure, Cook himself had hold of the elder chief as they walked away from the town towards the beach. Kalaniʻōpuʻu's favorite wife, Kānekapōlei, saw them as they were leaving and yelled after her husband but he did not stop. She called to the other chiefs and the townspeople to alert them to the departure of her husband. Two chiefs, Kanaʻina (Kalaimanokahoʻowaha), the young son of the former ruler, Keaweʻopala and the king's personal attendant named Nuaa followed the group to the beach with the king's wife behind them pleading along the way for the aliʻi nui to stop and come back. By the time they got to the beach, Kalaniʻōpuʻu's two youngest sons, who had been following their father believing they were being invited to visit the ship again with the ruler, began to climb into the boats that were waiting at the shore. Kānekapōlei shouted to them to get out of the boat and pleaded with her husband to stop. The ruler then realized that Cook and his men were not asking him to visit the ship, but forcing him. At this point he stopped and sat down. Cook's men and the British Marines were confronted on the beach by an elderly kahuna who approached them holding a coconut and chanting. They yelled at the priest to go away but he kept approaching them while singing the mele. When Cook and his men looked away from the old kahuna, they saw that the beach was now filled with thousands of Native Hawaiians. Cook yelled at Kalaniʻōpuʻu to get up but the ruler refused. As the townspeople began to gather around them, Cook and his men began to back away from the crowd and raise their guns. The two chiefs and Kānekapōlei shielded the aliʻi nui as Cook tried to force him to his feet. Kanaʻina approached Cook, who reacted by striking the chief with the broad side of his sword. Kanaʻina instantly grabbed Cook and lifted the man. Some accounts state that Kanaʻina did not intend to hit Cook while other descriptions say the chief struck the navigator across the head with his leiomano. Either way, Kanaʻina released Cook, who fell to the sand. As Cook tried to get up, the attendant, Nuaa fatally stabbed him with a metal dagger, coincidentally traded from Cook's ship during the same visit. Cook fell with his face in the water. This caused a close-quarters melee between the townspeople and Cook's companions. Four of the Royal Marines (Corporal James Thomas and Privates Theophilus Hinks, Thomas Fachett, and John Allen) were killed, and two were wounded. The remaining sailors and marines fired as they fled to their small boat and rowed back to their ship, injuring and killing dozens of Native Hawaiians on the beach, including possibly High Chief Kanaʻina. Cook's ships did not leave Kealakekua bay until 22 February. They remained for another week to continue repair of the mast and collect better quality drinking water. According to John Ledyard's journal's hundreds of natives were shot in a series of ongoing skirmishes. The ships cannon was used on several occasions among the natives and a large portion of Kireekakooa, the southern town in the bay, was burned. A young William Bligh, the future captain of HMS Bounty, later claimed to have been watching with a spyglass from Resolution as Cook's body was dragged up the hill to the town where it was torn to pieces. In fact, Cook's remains were treated differently: the high esteem in which the islanders held Cook caused them to retain his body. Following their practice of the time, they prepared his body with funerary rituals usually reserved for the chiefs and highest elders of the society. The body was disembowelled, baked to facilitate removal of the flesh, and the bones were carefully cleaned for preservation as religious icons. Some of Cook's remains, thus preserved, were eventually returned to his crew for a formal burial at sea. ^ a b Alan Robert Akana (March 2014). The Volcano Is Our Home. Balboa Press. p. 25. ISBN 978-1-4525-8753-0. ^ James Cook (1821). The Three Voyages of Captain James Cook Round the World. ... Longman, Hurst, Rees, Orme, and Brown. ^ Claus M. Naske; Herman E. Slotnick (22 October 2014). Alaska: A History. University of Oklahoma Press. p. 55. ISBN 978-0-8061-8613-9. ^ James L. Erwin (2007). Declarations of Independence: Encyclopedia of American Autonomous and Secessionist Movements. Greenwood Publishing Group. p. 62. ISBN 978-0-313-33267-8. ^ Jeff Campbell (15 September 2010). Hawaii. Lonely Planet. p. 38. ISBN 978-1-74220-344-7. ^ Ruth M. Tabrah (17 December 1984). Hawaii: A History. W. W. Norton. pp. 19–22. ISBN 978-0-393-24369-7. ^ Marshall Sahlins (1 October 1996). How "Natives" Think: About Captain Cook, For Example. University of Chicago Press. p. 3–. ISBN 978-0-226-73369-2. ^ Melissa Meyer (4 February 2014). Thicker Than Water: The Origins of Blood as Symbol and Ritual: The Origins of Blood as Symbol and Ritual. Routledge. p. 184. ISBN 978-1-135-34200-5. ^ a b James Zug (2005). The Last Voyage of Captain Cook, the Collected Writings of John Ledyard National Geographic adventure classics, For Example. National Geographic Society. p. 92. ISBN 9780792293477. ^ a b c Sparks, Jared (1847). Life of John Ledyard, American Traveller. C. C. Little and J. Brown. pp. 136–139. Retrieved 12 February 2018. ^ Jerry D. Moore (24 May 2012). Visions of Culture: An Introduction to Anthropological Theories and Theorists. Rowman Altamira. p. 336. ISBN 978-0-7591-2219-2. ^ Stephen H. Sumida; Sumida S. AND THE VIEW FROM THE SHORE (cl). University of Washington Press. pp. 18–19. ISBN 978-0-295-80345-6. ^ Daniel O'Sullivan (30 March 2008). In Search of Captain Cook: Exploring the Man Through His Own Words. I.B.Tauris. p. 224. ISBN 978-0-85771-350-6. ^ Oregon Teachers' Monthly. 1903. p. 3. ^ Sheldon Dibble (1843). History of the Sandwich Islands. Press of the Mission seminary. p. 38. ^ Taylor, Albert Pierce (1922). Under Hawaiian Skies: A Narrative of the Romance, Adventure and History of the Hawaiian Islands. Honolulu: Advertiser Publishing Company, Ltd. p. 66. OCLC 479709. ^ Kanalu G. Terry Young (25 February 2014). Rethinking the Native Hawaiian Past. Routledge. p. 55. ISBN 978-1-317-77669-7. ^ Grove A. Day (1 December 1993). True Tales of Hawaii & the South Seas. Mutual Publishing LLC. p. 318. ISBN 978-0-935180-22-0. ^ Lynne Withey (January 1989). Voyages of Discovery: Captain Cook and the Exploration of the Pacific. University of California Press. p. 387. ISBN 978-0-520-06564-2. ^ Ralph Simpson Kuykendall (1 January 1938). The Hawaiian Kingdom. University of Hawaii Press. p. 18. ISBN 978-0-87022-431-7. ^ Hawaiian Historical Society Reprints. s.n. 1791. p. 70. ^ Richard Tregaskis (November 1973). The warrior king: Hawaii's Kamehameha the Great. Macmillan. p. 115. In Hawaiian religion, the deity Lono is associated with fertility, agriculture, rainfall, music and peace. In one of the many Hawaiian stories of Lono, he is a fertility and music god who descended to Earth on a rainbow to marry Laka. In agricultural and planting traditions, Lono was identified with rain and food plants. He was one of the four gods who existed before the world was created. Lono was also the god of peace. In his honor, the great annual festival of the Makahiki was held. During this period, war and unnecessary work was kapu (forbidden). In Hawaiian weather terminology, the winter Kona storms that bring rain to leeward areas are associated with Lono. Lono brings on the rains and dispenses fertility, and as such was sometimes referred to as Lono-makua. Ceremonies went through a monthly and yearly cycle. For 8 months of the year, the luakini (temple) was dedicated to Ku-with strict kapus. Four periods each month required strict ceremonies. Violators could have their property seized by priests or overlord chiefs, or be sentenced to death for serious breaches. The Amy B. H. Greenwell Ethnobotanical Garden is a botanical garden near Captain Cook, Hawaii in the Kona District on the Big Island of Hawaii. The gardens closed for the public on January 31st, 2016. Charles Kanaʻina, officially referred to as His Honour and His Highness, was an aliʻi of the Kingdom of Hawaii and father of William Charles Lunalilo, the 6th monarch of the Kamehameha Dynasty. Kanaʻina was a descendant of several figures from ancient Hawaiian history, including Liloa, Hakau and Umi-a-Liloa of Hawaiʻi Island as well as Piilani of Maui. He served on both the Privy Counsel and in the House of Nobles. He was named after his uncle Kanaʻina, a name that means "The conquering" in the Hawaiian Language. This uncle greeted Captain James Cook in 1778 and confronted the navigator before he was killed.